The Rotation group allows you to rotate the particles on any axis, any orientation, and in different directions. Orient to Motion lets the particles orient to however they are moving. For example, an arrow can point in the direction it moves. By default, this setting is turned Off. Turn it on with the On option. Adds randomness to the Rotation setting. Surprise! More specifically, this parameter rotates the particle around a random axis. Useful for getting a more natural looking effect where all particles have unique orientation in space. 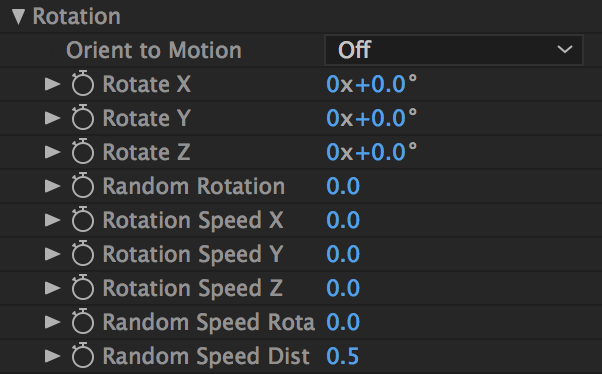 You can set the particle's Rotation Speed separately on each axis. Rotation Speed Z. Rotation speed on the z-axis. Enabled for Textured Polygon, Sprite and Star. There's even a Random Speed Rotation which makes the particles rotate using random speeds. Some of them will rotate fast, some slower, which is very useful in giving a natural appearance, for instance when making explosions.